On Saturday, August 11, 2018 Williams Township (Northampton County) experience torrential downpours and flash flooding. As a result of this flooding Fry’s Run overflowed its banks, sending a wall of water into Kleinhans Aqueduct. The flash flooding damage the aqueduct and the temporary bypass that carries water along the canal. The aqueduct wall on the west side was completely blown off and washed down the canal. The temporary bypass, that conveys water through the canal, was washed away. Currently, water is being diverted out of the canal at Theodore Roosevelt Recreation Area (TRRA) until repairs can be made to the aqueduct. The area between TRRA and Durham will have no flow until repairs can be made. The Durham pump has been turned on, so the area south of Durham will have a minimal amount of water on a short term, temporary basis. Over the next several days, we will be working on installing another temporary bypass over the aqueduct and hope to have water flowing through the area by the end of next week. No one would dispute that the Delaware Canal can be “challenging”, and, for the most part, 2018 has been a good illustration. The recently widened bypass trough is conveying more water south through the Tinicum Aqueduct. Impressive headway is being made on the complicated Phillips’ Mill Bridge replacement project, and, with luck, may be finished ahead of schedule this winter. The bypass trough that carries Lehigh River water past the bank break by the Tinicum Aqueduct was recently widened and now carries a much greater volume of water to Point Pleasant. Sinkholes near the Mountainside Inn and north of Lumberville prevent the State Park from allowing water to flow farther south. The permanent repair of the bank break is being designed by engineering consultants. DCNR has decided that the aqueduct itself will be repaired rather than replaced at this time. The “flexible flow concrete” repair technique that the Park has been using on canal prism sinkholes is working well. Unfortunately, new sinkholes are being discovered faster than the contractor has able to take care of them. The Kleinhans Aqueduct replacement is in the final design stage and should be put out for bids this fall with construction anticipated to begin in the winter/spring, depending upon conditions. Two stone wall repairs have been finished – the river wall north of the Virginia Forrest Recreation Area and the towpath bank wall in Erwinna. This season’s crazy storms did a number on the Canal. Raging inflowing streams deposited branches, logs, and debris at the mouth of Windy Bush Creek in New Hope and at the Bowman’s Hill waste gate. A stationary downpour caused the Canal to overtop its banks at one location in Yardley Borough. Localized flooding with property damage was a consequence of both. Clean-up is ongoing, engineering solutions devised, and improved response instituted. After being repaired and restarted late this spring, the Centre Bridge pump began shutting off nearly every evening during the heat wave. Investigation as to the cause is underway with fluctuating electrical power and the limitations of the safeguard device likely culprits. The installation of a submersible pump at Bowman’s Hill to supply water to the southern end of the Canal during summer dry spells is moving along at a snail’s pace, primarily because of State purchasing restrictions. The grass and weeds have grown sky high along the Canal, particularly in the north sections. The primary mower has been out of commission because vandals dumped dirt into its gas tank. Expecting water to be the culprit, not dirt, the Park maintenance staff, followed by the John Deere dealer, tried to dry out the tank several time. And then the dirt was discovered. The mower was back in service only to develop two different problems related to its thermostat, but it’s back in action now working its way south. The new Lower Limeport Bridge, completed last year, suffered significant damage when one or more large vehicle tried to cross it and hit the sides. Wood rails were ripped from their bolts, guide rails bashed, and there are scrape marks all along the length of the bridge. No one has come forward to confess to the damage. The Conrail embankment project continues to ¼ inch along. Permitting and permissions have taken an unimaginable length of time. The access, much simpler than originally envisioned, is in and shoring of the south side of the embankment is due to start. This project will not be completed as scheduled in the fall. The construction of a trail around the Tyburn Road encroachment, an easy project, is languishing in planning and permitting. When that is done, the Park staff will quickly construct the pathway. Depressions have developed over the culvert that carries the Cuttalossa Creek under the Canal. Sections of the culvert pipe have shifted. Holes will be drilled from the inside and the voids will be pressure grouted. On top of all this, the already lean Delaware Canal State Park staff complement is four full-time employees short. Missing are two Maintenance Repair persons and one Equipment Operator, which are vital to the upkeep of the Canal; and one Environmental Education Specialist. These positions have been open, for the most part, more than a year. 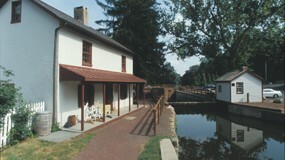 The State’s drawn-out hiring processes ( although, improvements have been initiated), hiring freezes, and the policy of having just one statewide pay scale, in spite of the fact that the cost of living varies greatly across the Commonwealth, all work to keep the Delaware Canal State Park in a constant state of need. These are issues to work on legislatively. So, with persistence things will improve. They have for the Canal’s 191-year existence. Come by the Locktender’s House at Lock 11 in New Hope and meet our new Locktender’s House guide. Susan Schneider answered our call for someone to staff our mini historic house museum on Saturday and Sunday afternoons. She’s been a member of the Friends for years, lives along the Canal, and knows more than a thing or two about the waterway and towpath. Best of all, she loves meeting people and she knits beautifully, a perfect pastime for sitting on the House porch. Stop by to see her. She’ll be in New Hope on weekends until the end of October. Thanks, too, to Donald Macfarlan, a retired New Hope Mule Barge Ride captain and musician, for filling in when Susan can’t be there. 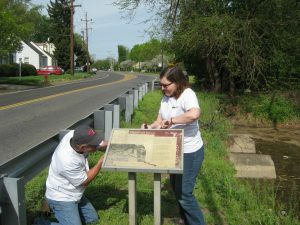 Eighteen new interpretive sign panels, which tell the Delaware Canal’s basic story, are in place along the length of the Canal. They’re more colorful, more accurate, and feature a better illustration of lock locations/elevations. Susan and Jeff Witte wrestle with a worn-out sign. 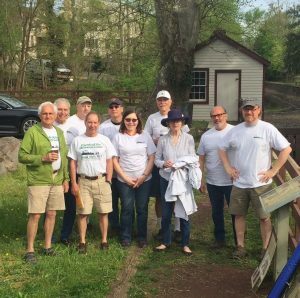 Nine Canal Action Team (known as CAT) volunteers met in New Hope on one of the rare Saturdays in May when it wasn’t raining, reviewed the process of removing the worn-out panels and installing the new, divided into two teams, and headed north and south. As you can tell from the photograph, coaxing old panels from their bases isn’t the easiest of jobs, but CAT accomplished the mission in a full morning. Many thanks!! The project of improving and replacing the basic wayside signs came together last October when thirteen guests at the Faces and Places fundraiser contributed the funds needed to design and fabricate the new signs. Much effort went to revising text and designing new graphics; followed by a significant period of review, revision, and approval by DCNR and partners. Now the new signs are in place and their design sets a standard for the other interpretive sign projects that the Friends have underway – a new 3-panel kiosk at Groundhog Lock in Raubsville, nine improved replacement panels in Historic Bristol Borough, and a new wayside sign in Smithtown. Take a look at the signs when you’re passing by on the towpath, and CAT can always use some more volunteers. CAT volunteers trained and ready to tackle sign panel replacement. Gene Kancianic makes final adjustments to the KayaArm kayak stabilizer. The Friends have purchased a kayak stabilizing device that has been installed on the wooden dock at Locks 22/23 aka Theodore Roosevelt Recreation Area in Raubville. The KayaArm was invented and is manufactured in Canada for the purpose of making getting in and out of a kayak at a dock safe and easy. Anyone who has participated in our kayaking adventures at this location knows that a stabilizer would be a good thing. CAT volunteers Pete Rosswaag and Gene Kancianic installed the KayaArm in July, and we’ll be trying it out during our Paddling the Canal sessions on August 18. It’s a relatively simple device with a cradle and arm that can be adjusted for varying water levels. If it works as advertised, the Friends will consider buying one or two more for other dock locations. Five volunteers have adopted four needy sections of the Canal. Welcome and Thank you, new Canal Tenders! Sunday, August 5, 10 A.M.
We’re coming for you, Berm Bank Trash! We’ll be in kayaks for In-Water Clean-Up Day, unlike this photo taken in 2011 when volunteers went right into the water. On what we hope will be a cool-ish Sunday morning, the Delaware Canal State Park educators will have their fleet of 12 kayaks at the Bristol Amish Market ready to go. 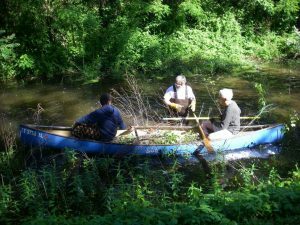 Can you be one of the volunteers who will paddle south from Green Lane and extract trash from the towpath and berm banks along the way? Or be an on-land assistant who can unburden the kayak crews of their accumulations? We’ll need about 12 hearty kayakers and 6 on-land helpers. The Park will provide paddles and PFD’s, in addition to the kayaks. The Friends will supply the trash bags and refreshments. Volunteers are asked to bring their own gloves and come dressed to tackle wet work. The trash and debris that lies just out of reach along the Canal is really frustrating. This clean-up effort should be a fun and effective way to leap from being frustrated to being finished. If you can help, please email friends@fodc.org or call 215-862-2021. It’s proven that a clean Canal stays cleaner. If the water level is low in Bristol in early August, we’ll switch our efforts to the Forks of the Delaware in Easton. If this change is necessary, we’ll put out the word on www.fodc.org. 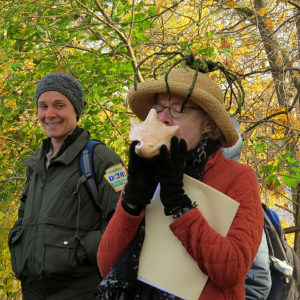 10 A.M. – NOON or 1-3 P.M.
Meet in the upper parking area of the Theodore Roosevelt Recreation Area aka Locks 22/23, 198 Canal Road, Easton, PA 18042. The parking area is accessed from PA Route 611 and is located between Riegelsville and Raubsville. This will be the second of four of our ever-popular paddling adventures. We’re pleased to be able to offer an additional date this year in cooperation with the very busy Delaware Canal State Park education staff. Taking off from the dock at Locks 22/23. You don’t even have to own a boat to see the Delaware Canal from the vantage of the water. State Park Educator Katie Martens has equipped kayaks ready to be loaned for these morning and afternoon sessions of paddling. They’re perfect opportunities to try out the sport of kayaking. You may bring your own kayak or canoe and personal flotation device or your may borrow one of the equipped kayaks that the Park staff will have on hand. 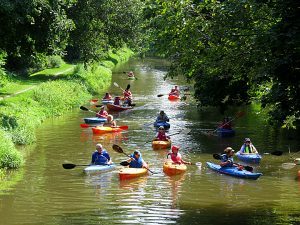 For each session, there are 16 seats available in 12 single kayaks and 2 tandems. Registration is required for this activity. Please do so early. You many sign up by contacting 215-862-2021 or friends@fodc.org. They are reserved on a first-come, first-served basis. If you are planning to use Park equipment, a $10 per person donation is requested on the day of the event. Saturday, August 18, 3 P.M. Historic Bristol Borough is a diamond with many facets. Join us as we discover some of the best. Our afternoon will begin at the Margaret R. Grundy Memorial Library, beautifully situated along the Delaware River. Two treats are in store there. “Paradise Ditch,” a short 1950’s era film about the Delaware Cana and surrounding area, will be projected. It’s a real period piece including shots of mule-drawn boats, locktenders, and skinny dipping whippersnappers taken during the preceding 25 years. Rich history, revitalization, community spirit and river views can all be experienced in Bristol Borough. 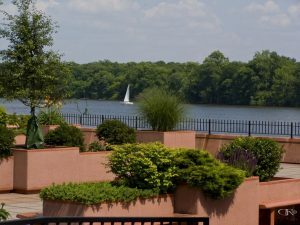 This is a view from the Margaret R. Grundy Memorial Library garden to the Delaware River. Also on view will be an exceptional special exhibit, “Made in America: The Grundy Mill and the Business of Spinning Wool. It features the iconic woolen mill owned by Bristol Borough’s foremost citizen and philanthropist Joseph R. Grundy. The daily lives of mill workers and the wool manufacturing process are featured, and the perspectives of industrialists and the political environment of the time are interwoven. It’s a fascinating story with compelling photographs and maps. Outside, we’ll take in the Library’s lovely rooftop patio garden and walk along the Delaware River using the new Bristol History Trail. There are benches for river and boat watching and a series of interpretive signs explaining the area. After our Library visit, you are invited to do the Bristol Stroll on your own. (Bristol Stomping is allowed, too.) The Stroll route will lead you down Radcliffe Street and into the center of town. Along the way, you will see exceptional colonial and Victorian buildings, the famous Wharf, the busy new pier and dock, and the monuments in Riverfront Park. The town’s many restaurants and shops along Radcliffe and Mill Streets await your visit. There is always something good happening in Historic Bristol Borough. Sunday, August 26, 4 P.M.
A new I-95 bridge is being built across the Delaware River at Scudder Falls. The gargantuan project started a year ago and won’t be complete until 2021. 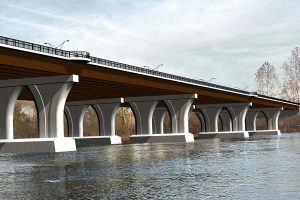 The new bridge structure will span both the Delaware Canal in Pennsylvania and the Delaware and Raritan Canal in New Jersey and includes a pedestrian/bike way with connections to both canal towpaths. An artist’s rendering of the new Scudder Falls Bridge, to be completed in 2021. Graphic courtesy of the Delaware River Joint Toll Bridge Commission. canal locks. First up on our 2.4-mile roundtrip walk will be the Dyer’s Creek waste gate and overflow south of Mt. Eyre Road. Here we’ll learn about the vital functions of these structures; then on to Lock 7 aka Borden’s Lock. The stone walls of Lock 7 were meticulously restored by the Friends more than a decade ago. The workmanship is well worth admiring as well as the spirit and conviction of the mason who re-laid each stone. Lock 7 is also home to the Delaware Canal State Park Maintenance Area, which has some interesting stories all of its own. The existing Scudder Falls Bridge and the sprawling new bridge construction site come into view as we cross Woodside Road. 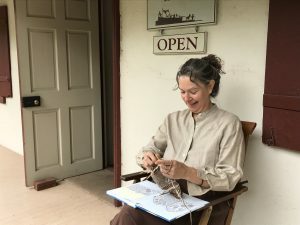 Take this opportunity to see the project up close and find out what’s to come, including a new Delaware River Joint Toll Bridge Commission headquarters, towpath trail connections, and comfort facilities in the 1799 House. Next up is Lock 6 aka Lear’s Lock, which is our turnaround point. Hear some of the colorful tales told by Chester Lear, the son of Lock 6’s last locktender. On our way back to Mt. Eyre Road, we’ll check out the sights that we may have missed on the way south. Take this opportunity to be in the know. Meet at Tinicum Park, 963 River Road, Upper Black Eddy, PA 18972. When entering the Park, follow the roadway back to the parking area closest to the Canal. Some sun, some shade. You can find what you like while paddling along the Canal. 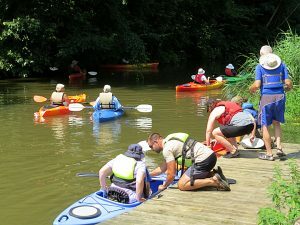 Delaware Canal State Park educator Katie Martens will be leading both the morning and afternoon sessions and will have fully equipped kayaks available to borrow. You may reserve a Park kayak or bring your own canoe or kayak and personal flotation device. Registration is required. The details are provided in the Paddling the Canal II – August 18 notice. The Park kayaks are claimed quickly, so call or e-mail as soon as you can, particularly if you’re planning to paddle with family or friends. See the Canal’s historic villages from the water. Meet at the Black Rock Road Picnic Area at the intersection of the Canal and Black Rock Road in Yardley. Autumn colors will surround us as we paddle south from Black Rock Road through the widest of the Canal’s widewaters. Trees tower overhead where mule-drawn canal boats pulled over to the side to get out of the way of “traffic,“ much like trucks pull over on highway shoulders today. The Canal widewaters have evolved into abundant habitats where turtles, great blue herons, ducks, frogs, fish and all sorts of other critters can be spotted. In this final paddling adventure before colder weather sets in, we should see an assortment of wildlife, perhaps even the beaver that we saw this spring. After instructing everyone on kayaking safety and technique, State Park Educator Katie Martens will lead the fleet south both in the morning and afternoon. She will have fully equipped kayaks available to borrow. You may reserve a Park kayak or you’re very welcome to bring your own canoe or kayak and personal flotation device. Registration is required. The details are provided in the Paddling the Canal II – August 18 notice. Please call or e-mail early, so that you don’t end up on the waiting list. The Park kayak are much in demand. This hearty and still smiling group walked all 58.9 miles of the Canal last year. Before the celebration of last year’s 30th Anniversary, there was a thought to change our Canal Walk around a bit in 2018, perhaps dividing the 58.9 mile trek into eight shorter sections rather the five traditional 12-mile-or-so legs. In fact, we even included a question in Canal News. When only one person responded that he thought that shorter walks would be a good idea and lots of people walked the entire 30th anniversary walk, the thought flew out the window. So, we will be doing Canal Walk 2018 in the way it’s always been done – five walks conducted over five successive Saturdays. This year we’ll be starting in Riverfront Park in Historic Bristol Borough and heading north to Easton. It’s time to start getting in shape and find the perfect pair of walking shoes. The full Canal Walk 2018 itinerary will appear in the Fall issue of Canal News and on-line at www.fodc.org. Will this be your year to take on the challenge and enjoy the sights and camaraderie? You are cordially invited to join the Friends of the Delaware Canal for our ninth annual signature event – Faces & Places – A Celebration of the Arts and History along the Delaware Canal. The stately Robert A. Shimer House on Riegelsville’s Mansion Row. A showpiece of the town’s industrial wealth, the stone mansion was built in 1898 with great style. Today it reflects its Edwardian heritage and the many interests of it current owner, who proudly serves as the local constable. The “Roebling Bridge,” one of the most graceful structures spanning the Delaware River. A walk from Riegelsville, PA to Riegelsville, NJ offers memorable views, refreshing breezes, and a bit of Brooklyn Bridge aura. Durham, a now quiet village where ore in the hills led prominent colonial investors to erect a nation-building iron furnace. The boats that carried George Washington’s troops were invented here, and a replica will be on view. A walk through the town’s gristmill will reveal the secrets of its inner workings, and the nearby historic houses beg to be strolled by. A ride through the countryside down to the river with picture-perfect farms, churches, pristine Cook’s Creek, and lovely vistas along the way. Ending the day by the Delaware River, we’ll arrive at the historic Riegelsville Inn where drinks, hors d’oeuvres and dinner will be waiting in the dining room and out on the canalside patio. For more information or to make reservations on-line, visit www.fodc.org and click on the Event link on the homepage or e-mail friends@fodc.org or e-mail friends@fodc.org. Individual tickets are $150 each; patron tickets are $250. Special sponsorship opportunities are available. 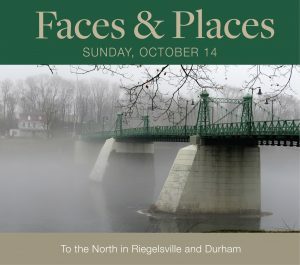 Join us for Faces & Places in the north! The crowd lined the towpath waiting for the racing ducks to drop into the Canal. Yellow rubber duckies connected the Friends to more than a thousand people this spring and summer. Smiles, creativity, and awareness blossomed. 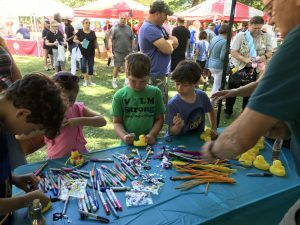 In the spirit of past Canal Festivals, the Friends sponsored “The Great Yardley Duck Race” on June 9 and had duck decorating booths at two First Fridays in Historic Bristol Borough and at the Tinicum Arts Festival. A good time was had by all in support of the Friends’ efforts to improve the Canal. At work at the Tinicum Arts Festival. Many thanks to our volunteer “duck handlers “ – Mark Baldwin, Bob Behney, Robin Butrey, Pam Can, Bart Davidoff, Richard Emmons, Susan Firestone, Margie and Rick Mingione, Susan and Lily Schneider, Larry Reinfeld, Pete Rosswaag, and Jerry Taylor. 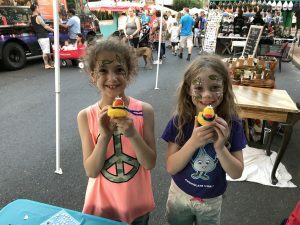 And we very much appreciate the help of the Bristol Borough Business Association, Tinicum Civic Association, Yardley Farmers Market, Yardley General and Yardley Borough in hosting our ducky activities. All finished at First Friday in Historic Bristol Borough. On May 30, the Pennsylvania State House of Representatives passed Resolution 901 recognizing the 125th anniversary of Pennsylvania’s state forest and state park systems. 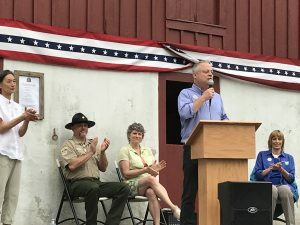 The PA Parks and Forests Foundation kicked off the 125th Anniversary with a gathering at the newly operational gristmill in Washington Crossing Historic Park. From left to right; Representative Helen Tai, Washington Crossing Park Manager George Calaba, Foundation President Marci Mowery, Representative Perry Warren, and DCNR Secretary Cindy Adams Dunn. A bill signed in 1893 formed the Pennsylvania Forestry Commission, tasked with the control of forest fires and to establish a forest reserve system. The system began with the purchase of 7,500 acres in Clinton County. Pennsylvania’s first state park was designated in 1893 to mark a Revolutionary War site. In 1976 it became Valley Forge National Historical Park under the jurisdiction of the National Park Service. Gifford Pinchot State Park is named after the nation’s “First Forester.” Pinchot was appointed by President Theodore Roosevelt to head the U.S. Forest Service and then served as Pennsylvania State Forestry Commissioner before becoming governor in 1923. In 1955, Maurice K. Goddard was appointed director of the Department of Parks and Forests. At the time there were 44 Pennsylvania state parks. Dr. Goddard proposed building a state park within 25 miles of every resident of Pennsylvania. Pennsylvania’s New State Parks: A Report to the General Assembly was released in 1957. It studied 175 potential state parks sites, which were evaluated on water, location, topography, subsurface conditions, availability, and scenic and historical significance. Acquisition of the some of the new state parks began immediately. Pennsylvania’s state park system was recognized in 2009 as the best in the nation by the National Recreation and Park Association. There were nearly 40 million visitors to Pennsylvania’s state parks and forests in 2017, generating approximately $4billion for the economy. Today Pennsylvania has one of the nation’s largest state park systems with 121 state parks encompassing nearly 300,000 acres. The newest state park in the system is the 500-acre Washington Crossing Historic Park. Saturday, September 22 at 6 P.M.
Back by popular demand! Eric Mintel’s music and Linda Kenyon’s dinners are irresistible. Join us for a captivating evening at a very cool location where you’ll have the chance to enjoy a unique music and dining experience. As you enter Linda’s striking home, you’ll be greeted by friends, spirits and savory hors d’oeuvres. After some mingling, seats will be found, and the acclaimed Eric Mintel Quartet will perform two sets of jazz with Linda’s famous soup served during the break. An elegant dinner creatively prepared by Linda in the best tradition of Julia Child will be ready when the music ends. Jazz legend Dave Brubeck said, “As long as the music attracts dedicated young musicians like Eric Mintel, jazz will continue to thrive and progress as a voice of freedom.” Joining Mintel on piano will be Nelson Hill on sax and flute, Brian Bortz on bass, and Dave Mohn on drums. The Quartet thrills audiences of all ages and connects with people all over the world. 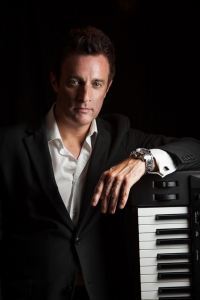 Bucks County’s Eric Mintel has played piano all his life. His career highlights include two performances at the White House, several concerts at the Kennedy Center, and a special concert at the United Nations. You won’t want to miss this special occasion! Donation: $100 per person for the concert and dinner. Please make your reservations by clicking here, calling 215-862-2021 or e-mailing friends@fodc.org. What a summer! 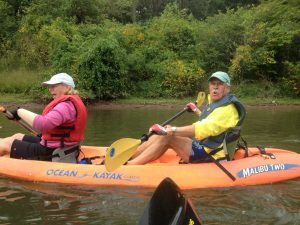 It’s been hot, hot, hot, but that hasn’t stopped the action along the Delaware Canal. Hurricane Hermine did not wreak any havoc. 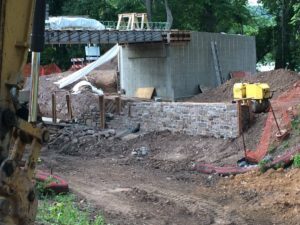 After the discovery of numerous sinkholes in Smithtown and Point Pleasant, areas notorious for leaks, DCNR quickly engaged Bi-State Construction to fill them with clay and regrade the towpath bank. With these sinkholes repaired, it is hoped that the Lehigh River water coming from the north will flow further south than it has since the Kleinhans Aqueduct problem. No more walking on the shoulder next to whizzing cars thanks to PennDOT’s Route 13 improvement project. Park visitors now can use a sidewalk to get from the towpath to the Green Lane intersection in Bristol Township. Still to come is a pedestrian crossing south of WaWa on Green Lane with pavement markings and flashing signals. This project is being facilitated by the Pennsylvania Environmental Council. After thorough investigations by DCNR staff, Sanders Power Company, and Campbell Electric, it has been determined that the 6,000 gallon per minute centrifugal pump that the friends purchased in 2003, before the floods, can be installed in the Delaware River at the northern “Bowman’s Hill” section of Washington Crossing Park. This pump can augment the flow in the watered-starved Canal when the River drops below the level of the New Hope inlet. Approval to operate the pump must be secured from the Delaware River Basin Commission. By relieving DCNR of the purchase of the new pump at Centre Bridge, the Friends have enabled the Park to undertake the following wall projects: the repair of the concrete wall on the east side of Lock 5 in Yardley, the repair of the stone wing wall on the southwest end of Lock 5, the repair of the stone retaining wall north of Locks 22-23 by the Locktender’s House at the Theodore Roosevelt recreation Area in Raubsville, and the repair of the stone retaining wall along the towpath underneath Woody’s Bridge in Williams Township. Woody’s Bridge is one of the remaining six authentic camelbacks. By investing $27,000 in the Centre Bridge pump when the Park most needed it, the Friends have leveraged a $44,000 expenditure in wall repairs by DCNR. 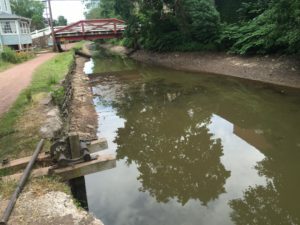 The hope of having water diverted from the Point Pleasant Pumping Station into the Canal has been dashed, at least temporarily, because of the continuing drought and the well contamination problems in Bucks and Montgomery Counties. The Forest Park Water Authority must retain water for its customers. The water levels in the Canal from New Hope south to Bristol range from very low to bone dry. The heat waves and drought have dropped the level of the Delaware River below the level of the New Hope inlet located behind Odette’s. When the gauge measuring the river level at Trenton, NJ reads less than 9 feet, there is no water entering the Canal. Water levels can be checked online at water.weather.gov – National Weather Service Advanced Hydrologic Prediction Service. After all that Hermine forecasting hype, it would have been nice to have a moderate amount of rain. In July, tornado-like winds ripped through the Bowman’s Hill area. Enormous trees fell – more than a few of them into the Canal. DCNR brought in crews from other parks to deal with the immediate damage, but there is still much cutting and removal to do. Falling trees have plagued the Canal ever since Hurricane Sandy. It seems that a tree clearing contingent might need to be added to the Park maintenance staff or perhaps some assistance from the private sector. As always, the Friends endeavor to meet the Canal’s challenges – in a multitude of ways. The reconstruction of the Redfield Bridge by Bi-State Construction is nearly complete. It crosses the Canal just north of Centre Bridge. Towpath users are ecstatic to be able to travel their PA/NJ Loop Trail again, and the Friends are tremendously pleased to have the reconstruction reflect the years of incremental work that has gone into creating a bridge design that conveys the Canal’s historic character while accommodating 21st century needs. Bridges have always been of special interest to the Friends. Our organization has restored three of the six remaining authentic camelback bridges. The fourth was restored through the Save America’s Treasures program. At our urging, the DCNR engineers prepared a detailed guidebook for the repair of all six. Nearly twenty years ago, after seeing each new Canal bridge have a different look, the Friends collaborated with the firm of Simone, Jaffe, Collins on the production of prototype bridge designs that could accommodate different traffic carrying capacities. The basic prototypes influenced PennDOT’s design decisions for five canal-spanning bridges and counting. As each bridge was built, the basic design was evaluated and improvements incorporated into the plans for the next. Over the past several years, DCNR has been replacing the Canal bridges that it owns and maintains. Generally, the bridges provide required access to private property, either connecting the property to public roadways or other parts of the property itself. Once again design became an issue. The “commonly understood” faux camelback truss and guiderail designs to be used for the new bridges proved not to be so understood. The construction of the bulky Upper Limeport Bridge was a turning point. 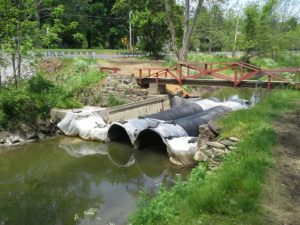 After the Friends cried “foul,” DCNR agreed to reconsider its design process, especially since several more bridge replacement projects – Redfield, Lower Limeport, and Phillips’ Mill – were in the pipeline. 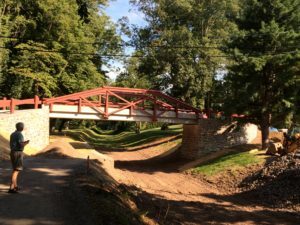 DCNR hired the Wilson Consulting Group of Mechanicsburg, PA to undertake the development of a different, more historically and contextually correct bridge design. Bill Wilson, principal of the firm, undertook the task with tenacity and enthusiasm consulting with the Pennsylvania Historical and Museum Commission and the Friends. One of the key goals of the new design was to have Delaware Canal bridges reflect the delicacy of the original camelbacks while meeting current day requirements. New materials, technology and creativity have allowed that goal to be met. The Redfield Bridge is the first bridge to fully utilize the new design standards, and, although there are still some small wrinkles to be ironed out, Redfield Bridge is, by far, the best yet. The Bi-State Construction masons did a particularly fine job with the stone masonry. DCNR continues with its bridge replacement projects with the Lower Limeport Bridge next up. Bi-state Construction has won the bid, and installation of the coffer dams and pipes to allow water to flow in the Canal is expected to get underway in late fall or early winter. May this bridge be even better. We have been working on several projects over the summer and have recently competed some emergency sinkhole repairs. In the beginning of August, after a heavy rain storm, the Park maintenance crew discovered several large sinkholes between Bridges 2 and 3 to the Smithtown section of the Park. Upon closer inspection it was determined that there were more than a dozen sinkholes, with additional holes in the Mountainside Inn section of the Park. Over the course of three weeks Park maintenance staff and contractors were able to excavate the sinkholes, line them with bentomat, pack them with clay, cover them with topsoil, and reseed the berm of the canal. Repairs were completed the last week of August and the canal has been re-watered. The Redfield Bridge project is coming to an end. The finishing touches are being made to the towpath, some minor adjustments being made to the trusses, and some clean up and restoration work being completed at the work site. Final inspection of the project should be forthcoming. There are also two upcoming projects where the bids have been awarded. The Mile Post 21 wall repair project and the Lower Limeport Bridge replacement should be starting within the next few months. Finally, there will be a maintenance draw down of the Canal during the last week of September. Due to regulations regarding the endangered red-bellied turtle, all de-watering activities must occur prior to October 1st. The draw down will enable the Park to work on several small wall repair projects, to conduct inspections of the canal prism, and to perform preventative maintenance. The growing season is drawing to a close at the Locktender’s House garden in New Hope. Goldfinches and squirrels are squabbling over the sunflowers, and there are enough tomatoes to share with passersby. When the Friends restored the Locktender’s House in 1993-94, the grand plan included not only the creation of the “Life at the Lock” exhibit inside, but also the creation of a period vegetable and flower garden in front. Since locktenders and their families typically had gardens for their own use and to grow produce that could be sold to canal boat crews, the establishment of a garden seemed a natural. Friends’ volunteers transformed a grass patch into a fine plot surrounded by a white wooden picket fence typical of the period. It has become part of the overall story of “Life at the Lock” and delights visitors who enjoy its beauty and engage the volunteer gardeners in conversation. Over the years, the white picket fence took beatings from both nature and vandals. Repairs were routinely made, but by last year, it was clear that it was time for a new fence. 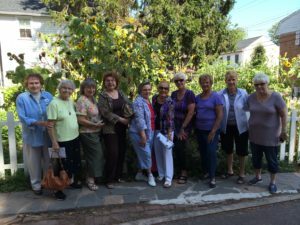 To the rescue came the Dames of Rocksville Questers, who after hearing about the garden at a Friends’ presentation, selected the fence project as the recipient of their annual preservation grant. In April, members of the group arrived at the Locktender’s House with a $900 check. The funds were promptly spent on fencing materials, and member Josh Gradwohl started to construct the fence from scratch. No premade sections for Josh. New posts were installed, and volunteers spent a morning staining the pickets. Josh and Jerry Taylor then proceeded to make a fence materialize, just in time for the grapevines to call it home. The Friends are very grateful to the Dames of Rocksville Questers for making the fence replacement possible. Half of the $900 grant was provided by the Dames chapter and was matched by the State Quester organization. The Dames of Rocksville Questers originated in Holland, PA and now includes more than 15 members from the Lower Bucks County area. Questers is a non-profit organization which encourages an appreciation for antiques and the preservation and restoration of historic sites. Our talented and willing volunteers took the contributed materials and transformed them into a handsome, strong fence, and we are very appreciative. Blankets of green appeared on the Canal’s water surface this summer. This green isn’t new, it starts to appear every year around May. Its bright chartreuse hue and abundant growth make it hard to miss. But what is it?? It’s not algae or slime or an invasive. It’s duckweed – a plant that has many good qualities. 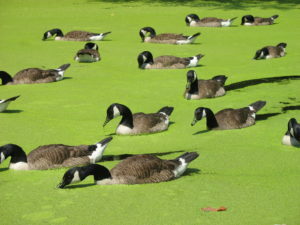 Canada geese gobble up duckweed. Lesser Duckweed (Lemna minor) is one of the smallest flowering plants in the world. It consists of just two leaves and a root. Duckweed likes to grow in warm, slow-moving, nutrient rich freshwater environments, which makes the Delaware Canal an ideal habitat for this tiny plant. What is duckweed good for? Food: Duckweed contains twice the protein, fat, and nitrogen and phosphorus of other similar plants. Its high nutritional content makes it an excellent source of food for waterfowl and fish. (Carp are particularly fond of it.) It is a primary food source for migrating waterfowl. Shade: A mat of duckweed shades the water below, inhibiting the growth of algae and other plants that can choke nutrient-rich waterways. Cleansing: Duckweed can help lower water pollution levels by absorbing nitrates, phosphates, and ammonia, which are chemicals found in fertilizers and waste water. It is often used as a biological treatment for waste water from large-scale commercial farms. Reuse: After it is easily skimmed from the water, duckweed can be fed to animals and poultry and used as compost or fertilizer. In the height of summer, duckweed can obscure the scenic value of the Canal, but is has its benefits and is far better for the environment than algae and invasive plants. And if you want a great addition to your compost pile, feel free to skim some off and take it home. Thanks to Ian Kindle, Delaware Canal State Park Educator, for providing this information and photo. If you are planning to use Amazon for holiday shopping this year, please remember that the Friends of the Delaware Canal is eligible to receive contributions from the AmazonSmile Foundation. Designate the Friends when you make a purchase from Amazon, and the Friends will receive a contribution. Here’s how it works. Visit AmazonSmile on the internet, and choose Friends of the Delaware Canal as your charitable organization. For eligible purchases, the AmazonSmile Foundation will donate 0.5% of the purchase price to the Friends. It’s a quick and easy way to spread holliday cheer not only to the peo0ple on your gift list, but to the Friends, too. 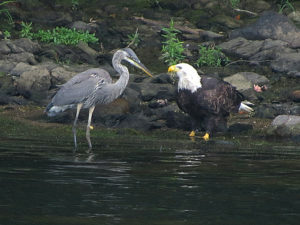 Nearly 450,000 people have seen this photo of a bald eagle and a great blue heron on the Friends of the Delaware Canal Facebook page. When all the views are in, we may even reach a half million! Carole Mebus, Friends’ member and photographer extraordinaire, shares her photos with the Friends, and we post them on Facebook. In case, you weren’t among the many who saw the post, here’s the story of her amazing encounter. If you would like to see seven of the 96 photos, visit the Friends’ Facebook page, and while you’re there don’t forget to “Like” it. It’s hard to imagine that Carole won’t have more to share. Three new Canal Tenders answered the call for help in the summer issue of Canal News. Thank you! Jim and Katie Wolf have adopted the Bridge Street to Lock 9 section of the Canal in New Hope. Harry Dozer will be providing weekend assistance to Peter Shaw in taking care of the Bridge 3 to Bridge 2 stretch in Smithtown. Only 5.4 miles of the Canal are still orphans. Wouldn’t you like to adopt one? Find out how by going to www.fodc.org and clicking on HELP on the navigation bar. A new, more efficient pump, purchased by the Friends and New Hope for Our Canal, supplied River water into the Canal filling the Centre Bridge to Lock 11 section in New Hope nicely. 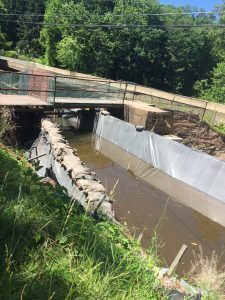 After extensive culvert cleanouts in the southern end, the Delaware River water flowing into the Canal through the New Hope inlet filled the Canal so high that its water was overflowing the coffer dam at the Lagoon in Bristol Borough. A water-filled Canal in Lumberville on May 8, 2016. The key word is “filled.” The many sections that typically have had water were brimful. New to the watering scene were Smithtown, Point Pleasant, Devil’s Half Acre, and Lumberville – communities that haven’t seen consistently high water since 2004. The Canal levels from Morrisville to Bristol Borough were also uncommonly high. Only 1-1/2 miles of dry-ish Canal prism prevented the achievement of our goal of a “fully watered Canal.” So tantalizingly close. Then came the discovery of a leak in the Kleinhans Aqueduct, which spans Fry’s Run, seven miles south of Easton. The DNCR engineers confirmed that a previously identified issue with several of the structure’s steel beams had become an immediate problem. 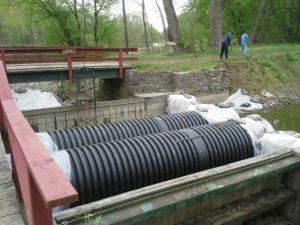 Much to DCNR’s credit, it quickly moved forward with the installation of two 60″ diameter pipes and associated coffer dams that allow Canal water to continue to flow through the aqueduct structure without exacerbating the structural problem. The amount of water coming through the pipes is impressive, but the flow volume through the aqueduct has been reduced. The use of the two pipes, rather than the full rectangular aqueduct structure, has limited the Canal flow to an amount that reached only as far as the north end of Point Pleasant. A donor paid the electricity bill for a week-long experiment to determine whether a boost from the 6,000 gallon per minute Durham pump would push water farther south. The boost seems to have produced a low level of water extending to the northern end of Lumberville, but a final determination of the effect is still in progress. The cost of operating the Durham pump is $180+ per day, so careful evaluation of cost and benefits is necessary. These pipes are allowing water to flow through the damaged Kleinhans Aqueduct. The Kleinhans Aqueduct pipes are a temporary fix. Replacement or substantial repair of the aqueduct, which fortunately is the shortest one on the Canal, is the permanent solution. Replacement or repair is the only way to get a significant flow of “free” Lehigh River water flowing through Point Pleasant, Lumberville, Centre Bridge and New Hope again. DCNR has included the project in its 2016-2017 budget. Another remedy may be the diversion of water form the Point Pleasant Pumping Station into the Canal at the southern end of the village. 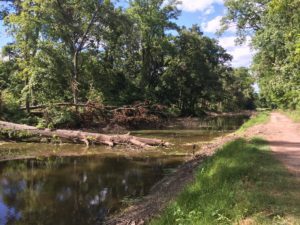 DCNR and DC21 have been working on an agreement with the Forest Park Water Authority to allow this diversion, which was first tried more than 15 years ago. Now on to the Canal from New Hope to Bristol. The prolonged lack of rain has caused the Delaware River to drop below the level of the canal inlet located behind the former Odette’s in New Hope. This inlet supplies Delaware River water into the Canal and is the only significant water source for the southern 25 miles of the Canal from New Hope to Bristol. When the River drops below the inlet level, the Canal drops. The level of the Canal in Yardley Borough on June 27, 2016. 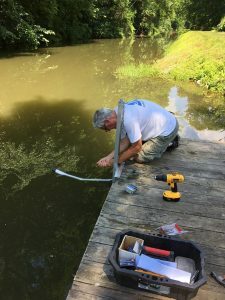 In earlier issues of Canal News, you have read about the Friends’ investigation into the installation of an Archimedes Screw pump near the inlet location. This investigation continues, but, meanwhile , the feasibility of installing at 6,000 gallon per minute centrifugal pump at the inlet location is also being pursued as a quicker fix to the need for water augmentation. Another consequence of the dry weather is that evaporation and tree and vegetation absorption are outrunning the Centre Bridge pump’s ability to keep its section reasonably full. The best and easiest cure for the water woes from New Hope to Bristol is moderate rainfall. Rain dances by all are most welcome. Work on all the component parts of the Redfield Bridge project is underway. Bi-State Construction is making good progress with the replacement of the Redfield Bridge just north of Centre Bridge. The project extended beyond its anticipated duration because the east abutment had to be replaced rather than repaired. The project’s completion will be happy news to the bikers and walkers who use this popular Centre Bridge/Lumberville/Bulls Island/Stockton/Centre Bridge canal loop trail. Additional project updates are included in the Park Manager’s Report. For the latest information, check the Breaking News page. The Delaware Canal does present its challenges, but we have come so far and the magnitude of the challenges continues to decrease. We always keep on trying during trying times because the glorious days of May have proven that the canal is more than worth our efforts. It is truly an honor for me to be named the new Park Manager at the Delaware Canal State Park Complex. I am looking forward to working with the staff, the local communities, and multiple partners seeking to improve the park. This is an excellent opportunity , and I am looking forward to the new challenge in my career. I began my career with the Bureau of State Parks in 1994 working as a semi-skilled laborer at Neshaminy State Park. I have held positions as a semi-skilled laborer, intern, and DCNR Ranger at several state parks and as a Park Manager trainee at the Park Region 4 Office. In 2005, I was named the Assistant Park Manager at the Hickory Run State Park Complex, and in 2007, I was named as the Park Manager of Neshaminy State Park. I hold a bachelor’s degree in Recreation from Lock Haven University and will be moving to the Pipersville area with my wife and three children. We currently have two projects in progress – the culvert replacement on Airport Road in Bristol Township and the Redfield Bridge replacement in Solebury Township. Also, in 2016, a large wall repair will be taking place at Mile Post 21 in Upper Makefield Township. We are anticipating that the replacement of the Phillips’ Mill Bridge and Lower Limeport Bridge, both in Solebury Township, will take place later this year or early in 2017. Also in 2017, we are planning for several projects. They include the tunnel through the railroad embankment just south of Morrisville and a large capital project to replace 12 bridges and culverts along the Canal. In New Hope, the Bureau has been developing conceptual plans for the relocation of Odette’s and the development of an enhanced visitor services area located by the old mule barge concession. Finally, work is progressing by PADOT to improve the towpath crossing at Green Lane and Route 13 in Bristol Township. The pedestrian crossing should be completed by the end of the year. More than 350 people turned out this spring for the Friends’ annual Canal Clean-Up Day. Thirty-two coordinators organized coverage of all 58.9 miles of the towpath and waterway. 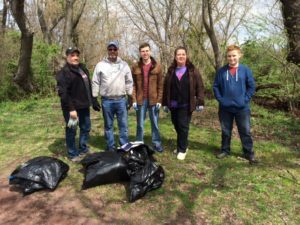 Most of the trash picking and brush clearing took place on showery Saturday, April 2, but some Canal Tenders and other groups chose other days with Falls Township Boy Scout Troop 46 finishing off the effort on May 7. 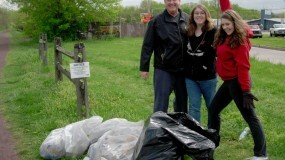 The volunteers who covered the Green Lane to the Lagoon section of Bristol Borough pose with the fruits of their labor. The Locktender’s House in New Hope is a “bank building” set into the canal bank at Lock 11. It rises three stories high on its South Main Street side, and two stories up on its towpath side. This spring three slates fell from the house roof on the towpath side, and the copper gutter on the Main Street side was miserably clogged. To the rescue came Jeffrey DeFrehn, Sr. and Jeffrey DeFrehn, Jr. of DeFrehn Roofing of Langhorne. They offered to fix the slate roof and clean the gutter at no charge because “we love historic buildings and want to help those who work to preserve them.” We are so thankful to the DeFrehns for this very necessary help. Jeffrey DeFrehn has been in the roofing business for over 40 years, and he and his team handle roofing projects from historic buildings to new construction expertly and efficiently. This year’s Delaware Canal Festival has evolved into a series of summer-long events. So many ducks to admire at the Delaware Canal Festival! 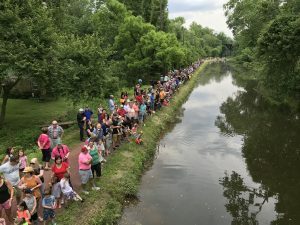 On June 17 the Delaware Canal Festival kicked off in Historic Bristol Borough. Lagoon Park and the green at Grundy Mill were filled with people who bought their dinner at a variety of food tracks and then stayed for the fun. The local Irish folk band, The River Drivers, set the rhythm for a parade of decorated boats and paddleboard exercisers who plied the calm waters of the Lagoon. Kids and adults decorated ducks for the big contest, played games, visited the tables of community groups, and sat relaxing on a perfect summer evening. The Delaware Canal Festival will arrive in downtown New Hope on Saturday, July 30. From noon to 4 p.m. come see plein air artists at work along the towpath, Civil War re-enactors at the Parry Mansion, and performers from the Bucks County Folk Song Society at Ferry Street Landing. There will be duck decorating at the Locktender’s House, a scavenger hunt, a guided walking tour of the Canal and an Instagram contest. 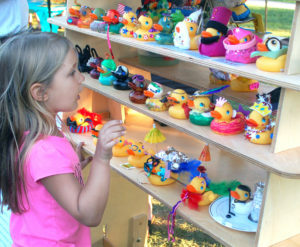 And there will be more duck decorating at the Delaware Canal Festival in Morrisville on Saturday, September 10. The State Park educators will be offering the opportunities to paddle kayaks in the Canal, and there will be plenty of good music, food, and fun, too. Don’t miss out on the rest of the ducky Canal Festival season! A blast from the conch shell horn starts each day of the Canal Walk. On October 31, 2015 we had a special helper, who liked hats. Break in your hiking shoes because the Friends are embarking on their 29th annual 58.0-mile-long Canal Walk this fall. 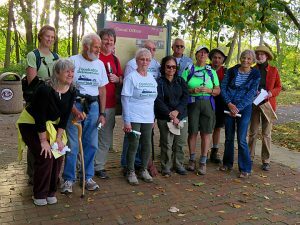 Conducted over five successive Saturdays, the Walk is starting at the Forks of the Delaware in Easton and ending at Waterfront Park in Historic Bristol Borough. Join in one or all of this year’s walks. The full Canal Walk 2016 itinerary will appear in the fall issue of Canal News and on-line at www.fodc.org. We hope that this is your year to take part in the challenge, the camaraderie, and the fun. Annette Heintz and “The Housewifes of Rolling Hills” have adopted the Uhlerstown to Lock 17 section in Tinicum Township. Sheree Cote and Tom Lurz are taking care of the Mountainside Inn to Lock 12 section in Plumstead and Solebury Townships. Monica Hemmers and Steve Heimann are back at work on the Lock 12 to Virginia Forest Recreation Area section in Solebury Township. Ricki Fisher is covering the Rabbit Run Bridge to Bridge Street section in New Hope. The work of our Canal Tenders truly makes a difference, and we’re grateful to have these new volunteers. We also thank the people who have taken care of these areas in the past – Joe Cloran, Sally Getchell, Nan Kirstein, and Bill Rorer. You can be a Canal Tender, too! 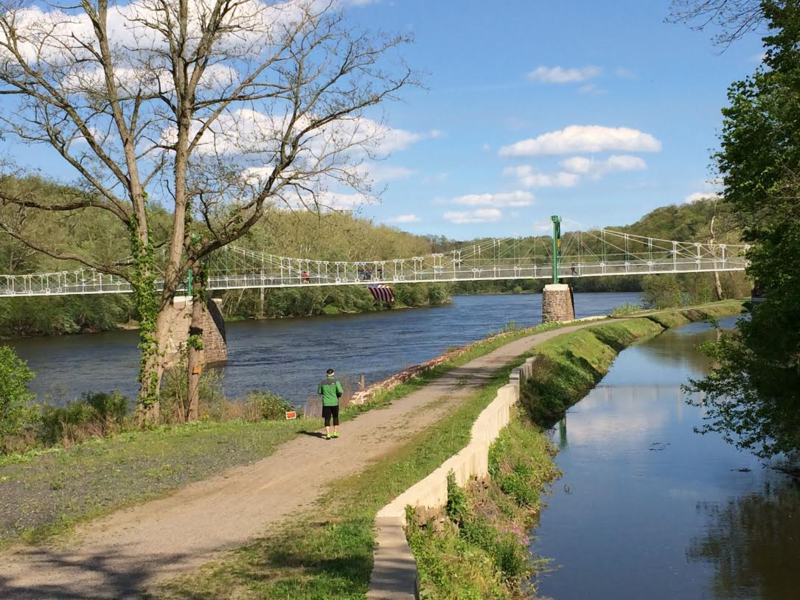 Beaver Street to Riverfront Park (Bristol Borough) – .8 mile. Only 5.9 miles of the Canal’s 58.9 mile length remain orphans – just 10%. Please help to bring our orphan rate down to 9%. The Delaware Canal State Park staff moved quickly to fix a collapsed 3ft. X 3ft. sandbag in the Kleinhans Creek Aqueduct coffer dam installation. Water is again flowing south from Groundhog Lock! Thank you! !